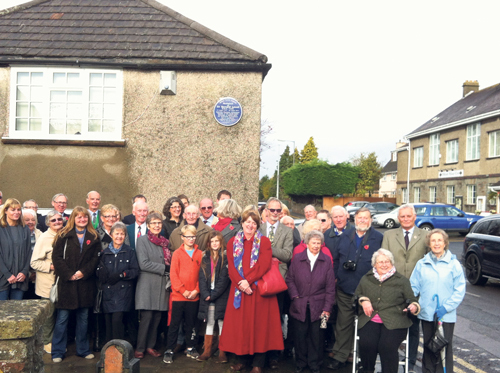 A BLUE plaque has been unveiled at the birthplace in Oldland Common of the scientist and astronomer Sir Bernard Lovell. His daughter Judy Spence and other family members attended the unveiling ceremony at the house at 94 West Street last month. The plaque was commissioned by Bitton Parish Council to honour the work and memory of Sir Bernard, who died in 2011, just short of his 99th birthday. Sir Bernard's love of science began at Kingswood Grammar School and after gaining a first-=class degree and PHD from Bristol University in the 1930s he went on to study cosmic rays before working on radar during World War Two. He moved his work from central Manchester to Cheshire, where he established the Jodrell Bank Observatory and the radio telescope that bears his name. He was knighted in 1961. Mrs Spence said it was amazing to think that they were standing in the street where her father had bowled his hoop, played marbles and “run with the pack”. After the unveiling, the family and other visitors attended an exhibition of work in St Anne's Church Hall by children from local primary schools and Sir Bernard Lovell Academy into aspects of the scientist's life and career. The exhibition can now be seen in the Giotto gallery at the academy.